Greek Letter Custom Embroidered Pool, Shower, Gym Wrap. 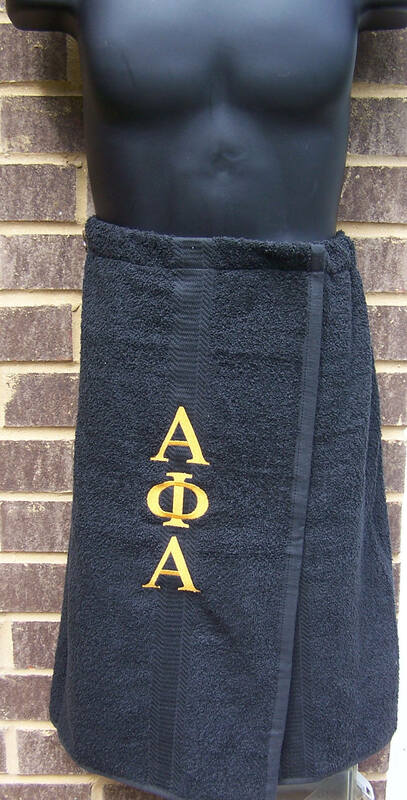 Black Terry Towel Wrap: 29" long X 54" wide with 6" adjustable Velcro closure; Elastic Waist; 100% Cotton Terry Towel -- Embroidered with Greek letters vertically down the front of the wrap. Embroidery is done with Gold Polyester thread. Other Wrap Colors available: Purple, White, Black, Pink, Hunter Green. SHIPPING: We ship from the Atlanta area Monday thru Friday via USPS . Please allow up to 4 days transit time.